How To Take The Perfect Photo Of Your Pet For A Pawp Shop Art Piece! Taking the perfect pic of your pet doesn’t have to be something only a professional photographer can accomplish. You happen to be one of the best suited for taking pics of your pet. Why? Because, for starters, your furry family member LOVES you and loves getting attention from you. Also, you know all of your pet’s best poses, expressions, and angles! Make sure that you can get your pet to sit or lay still before taking the picture. If your pet is hyperactive, try to play a game of fetch or tug of war to tire him or her out. That way your furry friend is much more likely to relax for a bit and sit for you. Keep treats handy so you can reward your pet for sitting still. If you’re using a smart phone, make sure you know exactly how to bring the camera to focus on your subject. For example, if you’re using an iPhone, tapping the subject of the photo on your screen will force the camera to focus on your subject (and will often adjust the lighting automatically as well). Take a bunch of pics and look through them later to find the one that is most in focus. Your Position Is Just As Important As Your Pet’s! Don’t shoot your photo top down or looming over your pet. Often times you’ll get the rest of his or her body beneath and it can sometimes blend in weirdly. Keeping your camera or camera phone at eye level with your pet will make for the best photo and Pawp Shop artwork. Don’t take the picture too close and make sure your pup’s face is not touching the edge of the picture. Unless you have a high quality zoom on your camera (most cell phones do not) take the picture no more than 6 feet away if you have a small dog, or 8 feet away if you have a large dog. If you have a darker colored pet, make sure there is enough light on them. Make sure there is enough lighting. Natural lighting is nice to have. If the sun isn’t out, just make sure to turn all the lights on in the room. Avoid too much light (overexposure). Direct sunlight can often wash your pet out, leading to a photo that almost appears to have white out smeared across it. Pick a place where your pup is comfortable and not too excitable – the calmer, more familiar the environment, the better as your pet will be much more amenable to a photoshoot and much less likely to run off chasing a squirrel or stray ball. For a Pawp Shop art piece, taking your photo in front of a solid background (like a wall, a solid printed couch, or in the grass) is ideal. Have fun with it! Get your pup’s personality out! If you’re having a good time, your pup is much more likely to enjoy their photo shoot. Again, employ some treats to get your dog behaving and excited. 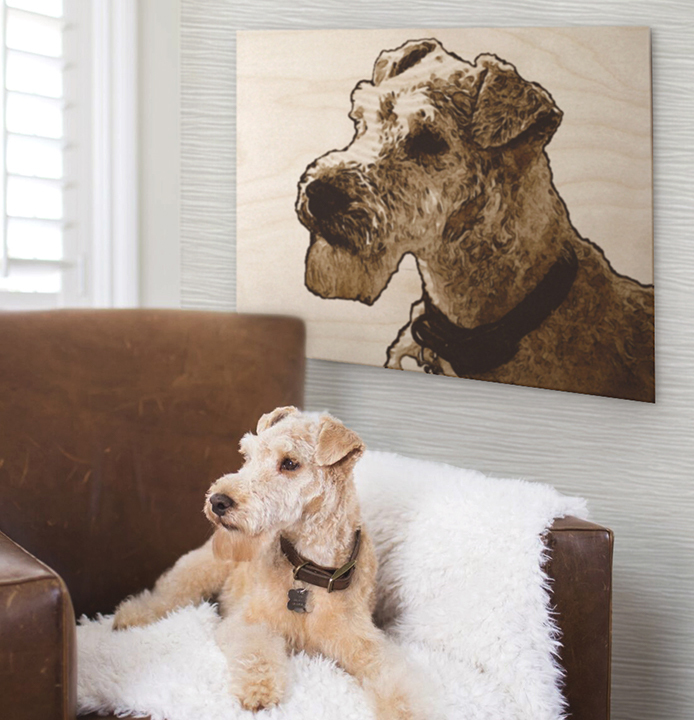 Pawp Shop is our custom art program for your pet in which you submit your favorite, high quality photo of your pet to be celebrated and memorialized in a beautiful, custom piece of art. Pawp Shop art pieces make for great gifts and are a wonderful way to showcase your pet’s unique personality as well as remember pets who have crossed the rainbow bridge. Learn more on our Pawp Shop page!